Hereditary Prince Alois is currently in New York City where he made a visit to the United Nations Headquarters this morning. 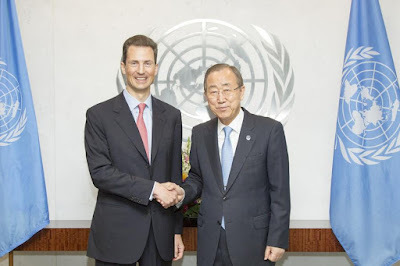 Liechtenstein's regent met with UN Secretary-General Ban Ki-moon for private talks and later gave a lecture at the United Nations' Dag Hammarskjöld Library entitled "A rule-of-law based agenda for a more effective United Nations". The audience included high-ranking UN officials as well as ambassadors to the intergovernmental organisation. The Hereditary Prince's visited to the United Nations Headquarters marked the 25th anniversary of Liechtenstein being admitted to the UN. Just as with many other international organisations, the Principality opted not to join them for a long time until becoming a member of the UN as well as the European Free Trade Area and the European Economic Area in the 1990's at the urging of Prince Hans-Adam II. This evening, a reception, also attended by Hereditary Prince Alois, is hosted at Liechtenstein's embassy to the United Nations to celebrate the 25th anniversary.